Put an interactive and educational spin on your next date night dinner out with one of these Orlando cooking classes. 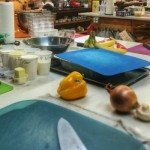 Whether you’re hoping to learn some new skills, pick up some fresh ideas or just have a fun night out together, you’re bound to find something you love from our list of 55 local cooking classes happening this August and September. Intermediate Techniques: This is a 4-part series! Couples Cooking: Spicy, Too Hot to Handle! Most of the prep work and set up are already done for you for classes at Truffles and Trifles. The Basics of Culinary: This is a 6-part series! This is How You Tailgate! Techniques I: This is a 4-part Series!